Get Your custom knit Thneed here! Perhaps the lovely Brenda has the solution to my Etsy conundrum. If anyone wants a custom Thneed, just leave a comment and we can talk… or LAUGH OUR BUTTS OFF! Seriously though, after our whole family survived a nasty bout of the Flu last week, I’m back into Etsy planning, and should have an update soon. Not really. But, it’s not ready yet. I HAVE made quite a bit of progress this week. It’s just that think my expectations of how much “work” I can get done while managing the bunnies and the house were a little, shall we say, lofty? AND I am commited to creating something of quality. I want to do it well, not just push myself to do it fast. So… shop will open soon, and while I won’t say EXACTLY when, I will promise to let you know just as soon as I can. Oregon received some spectacular weather this weekend and I took full advantage. The sunshine alone was enough to make me feel lucky and appreciated. 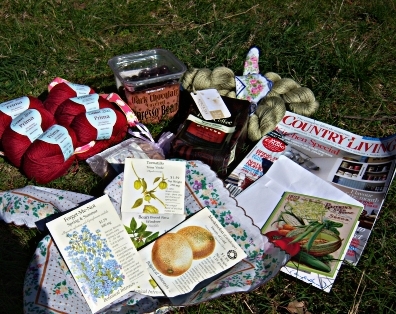 But then the postman delivered my Spring Swap package and I just about fainted. I am new to the knitswap thing (this is only my second), but MAN could this be addicting. My amazing swap partner sent the most beautiful things imaginable. Peets coffee, chocolate covered espresso beans, seeds for the garden (1/2 a cubic yard of soil arrives today… woo hoo! ), a scrumptious magazine to savor, the most delightful smelling soap I have ever sniffed (mama is NOT going to share this one). And yarn!!! Gorgeous, heavenly, drool worthy yarn. Blue sky alpacas silk in grassy green, and luscious red Debbie Bliss Prima (bamboo blend). Now if you will excuse me I have some knitting, and reading, and coffee drinking to do. Everything is coming together, and it’s very exciting. The shop will open one week from today, on the 17th. I’m starting with just a couple of things. Don’t fear, I have lots of others in the works that I’ll add in next few weeks. Keep watching this space , I’ve got a little treat in store for you too! The nice thing about creative angst is, when it works itself out, the result is usually more creativity. At least that’s what happened to me. 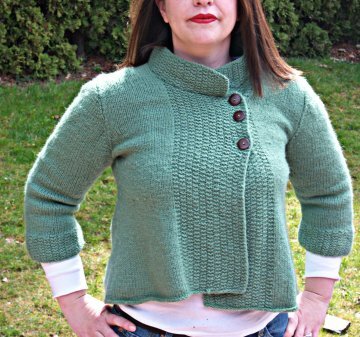 I’m knitting and scheming away, but can’t post any of it yet… here’s a new picture of an old sweater, to tide you over. I’m in the midst of planning a new creative endeavor. I’m knitting, sewing, taking and editing photos. I’m bouncing ideas off of anyone who will listen. It’s thrilling… just the ticket to fight the ennui I’ve been swimming in for the past few months. But last night, after getting up to bring baby bunny her bottle, I couldn’t sleep. The negative voices in my head started chattering. I listened for the valuable components of their critique, but could not shut them off. Today I’m throwing myself into the tasks that need to be done, letting the thoughts stew, trying to focus on the positive. I’m wondering, does this happen to you? How do you deal with this? You are currently browsing the Bunny Slippers blog archives for April, 2008.